For 100 years, the UJA Federation of New York has been identifying and serving the ever-changing needs of New Yorkers and Jews everywhere through the power of collective action. For their centennial year, we worked with UJA to create Jewish.nyc,﻿ a unique storytelling platform for reflecting on and celebrating the shared history of Jewish New Yorkers. Reflecting on the role they have played in shaping the Jewish community over the past 100 years, UJA sought to harness the power of storytelling for their centennial campaign to celebrate the vibrant energy and great diversity of Jewish New York. 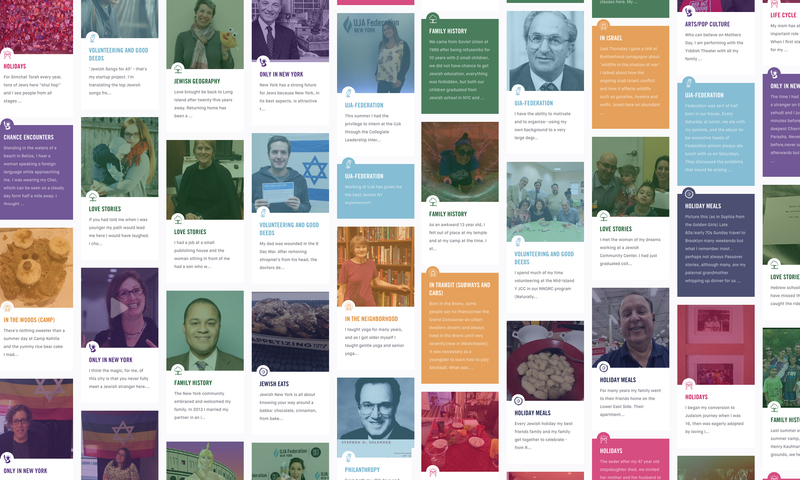 Centered on common thread of tradition and values that weave these experiences together, we built a Dango platform that allows users to seamlessly share the stories and memories that exemplify what it means to be a Jewish New Yorker. Storytelling is an integral part of Jewish tradition and in light of its powerful ability to unify and connect us all, UJA called the project "Your Story is Our Story." The centerpiece is a masonry waterfall of flexible cards featuring text, imagery, and video shared by hundreds of community members, all illustrating the memories and experiences of Jewish New Yorkers that are at once completely unique and very familiar. Shared experiences are categorized around curated content themes, like "Roots and Community" or "Jewish Eats" and categories, like "Jewish Geography" or "Memories in the Kitchen." We treated each theme with a color and a subtly animated icon to make filtering and scanning through the waterfall a visually engaging experience. Flexible card templates were also designed to ensure that even stories shared without an image or video supplement were still equally weighted and eye-catching. Django CMS seemed like a perfect fit for this platform and let our design and development teams quickly iterate on solutions throughout the project. Django also allowed us to design moderation utilities unique to UJAs needs, like a post approval workflow and a collection blacklisted words. Features like this make managing user-submitted content that much easier and maintains a safe and rich experience. Moving into their second century of service to the community, Jewish.nyc was conceived, designed, and launched with an eye toward refreshing and modernizing the UJA organization as a whole. Along with their newly launched website, this project helped to shift perception of their brand and engage Jewish New Yorkers beyond fundraising efforts, to truly feel a part of the community. UJA Federation’s annual campaign remains the single largest philanthropic undertaking by any local community anywhere in the world. Though Jewish.nyc is just one arm of their outreach, in its centennial year UJA saw their community vibrantly rejuvenated, demonstrated by an increase of over $30 million in raised funds.